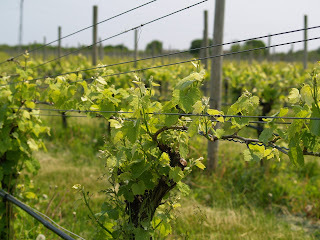 >We covered a decent amount of ground on our first week out on Easter Long Island. 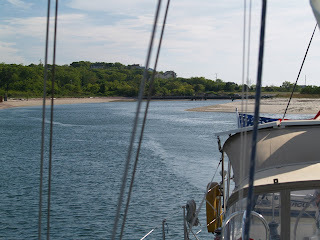 Since my last posting the weather improved as we headed from Greenport to Essex on the Connecticut River. That evening in Essex we had a great dinner as guests of our fellow Corinthians Rodney and Genie Devine. Rodney has crewed for me a number of times and is always a pleasure to have on board. 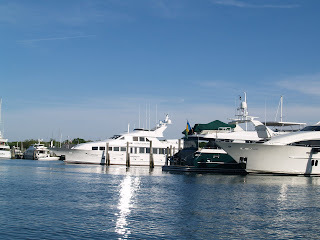 Essex Yacht club is a very friendly place, quite a contrast to the clubs in Sag Harbor. 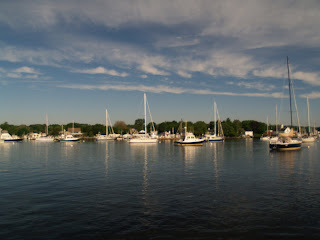 This is a shot of the mooring field outside of the club, which is right down town Essex from our boat in the anchorage. Yes, it’s really this quaint. While our trip over from Greenport began with a downpour, it ended up with a run some 10 miles past Essex in a beautiful afternoon cruise up to Haddam and the Goodspeed Opera House. 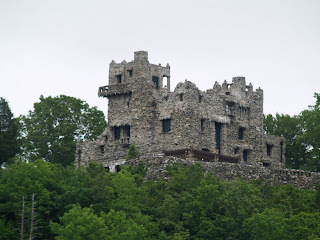 Along the way we also passed Gillette Castle, the home of an excentric actor who played Sherlock Holmes back at the turn of the last century. 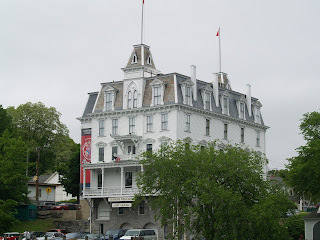 Here’s the Goodspeed Opera House and Gillette’s Castle. 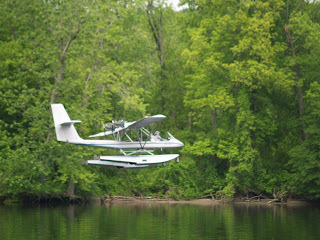 There’s also a small airport at Goodspeed Landing and we were treated to a flyover and touch and go landing by a great little pontoon ultralight. Watching him weave down the river just 50ft off the water was a sight to behold. That would really be fun to do sometime. There are lots of really quaint homes along the river and it’s fun to just enjoy as we motor by. On Saturday morning we motored down the CT River again and headed East to Mystic, catching a great SW breeze and an ebbing tide. 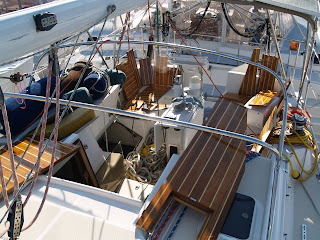 We covered the distance in really great time going some 7+ knots most of the way. We sailed right up the river to pick up my friend Keith’s mooring right near the swing bridge. 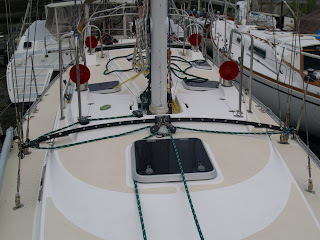 Keith and Rose own a SAGA 43 like Pandora and they travel South each winter to spend a few months in the Bahamas. Since they won’t be back until the end of June they agreed that we could use their mooring. After a really great sail it was time for payback when I started looking for Keith’s mooring which had sunk over the winter when the stick he put in place instead of the float sunk. I thought that I was all prepared with a grapple hook to find it but it turned out to be a much more difficult project than I had envisioned. I did find three other moorings fairly quickly it took many hours of dragging back and forth, often in the entirely wrong place it turned out, until I finally found it. Keith was very patient with me on the phone as I called him many times for encouragement and direction finding. I am sure that he would have found it rather quickly. 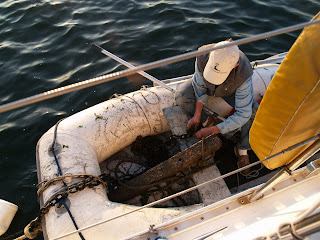 Here’s a shot of me untangling the lines and getting it ready to use. Anyway, all’s well that ends well and we had a great morning and afternoon in Mystic on Sunday prior to catching Amtrak to Bridgeport late afternoon. Now Pandora is safely on her mooring for two weeks until I head back up to spend a weekend with my son Christoper and one of his friends. Hopefully the weather will cooperate so we can make a weekend visit to Block Island. Things are a bit unsettled at work these days who knows what the rest of the summer will hold. >We had our first week of the season on Pandora beginning last Friday when we went from Norwalk Yacht Club out to Mattituck LI. We have visited this small harbor a number of times over the years and decided that we would make this our first stop of the summer. The channel is a long way in and winds past homes, boat yards and osprey nests. It’s very pretty. While we were there the weather was great. 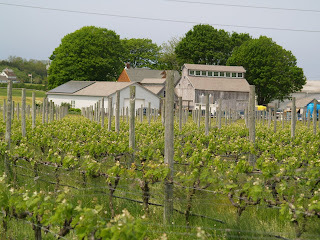 We even walked out of town about 2 miles to visit a vineyard. Shinn Vineyards a great little vineyard on the North Fork of Long Island. We took a tour given by Barbara Shinn who is really passionate about her farm which she keeps in a way that goes way beyond organic. Her current push is to get approval for a large wind generator on the property that will power the vineyard and tasting room. What a great place. Check out this view. 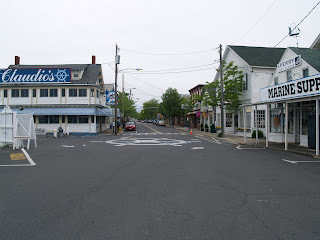 After that we went further out and spent a few days in Sag Harbor. What a contrast with all the big yachts. I counted a dozen over 100′. What recession? SAG isn’t very friendly if you don’t have $$$ to through around. 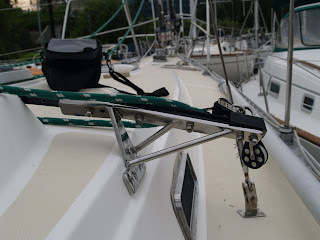 Moorings are charged by the foot at $2/ft, something that we have not run into anywhere else. They are doing an excellent job of keeping their moorings open and unocupied with that policy. Odd as you’d think that they would want to attract more dollars from the “little people” too. Since leaving SAG on Tuesday we have seen nothing but rain and cool weather. 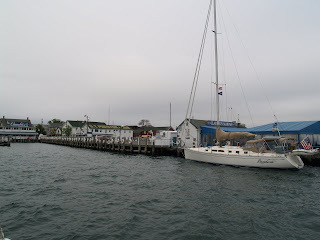 It’s Friday morning and we have been on the dock in Greenport checking out the town. It’s really a very nice town with lots of historic homes. Very nice. We even found a marina that would give us a free (almost) spot to tie up for two days. There wasn’t another boat around due to the weather and the fact that it’s still early in the season. Very different than SAG Harbor, I would say. The main street in town isn’t exactly hopping. We were told that Memorial Day Weekend was very busy. You can’t tell here. Also, Claudio seems to own much of the town businesses and is said to be the oldest family owned restaurant in the US. We ate there the first night because of the really cheap doc space. It was the least that we could do. Hard to imagine a marina with only one boat. Yes, it was just us. 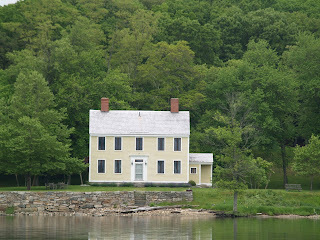 Well, have to sign off now as we are headed over to the CT River for a visit with some friends tonight in Essex. I have not been keeping up with my blog for many months but it’s been a busy winter working on Pandora. 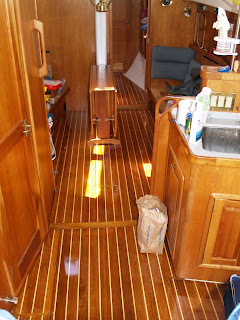 I put an automatic Espar cabin heater on the boat, upgraded the jib travler, modfied the companionway steps and completely removed and re-varnished the cabin sole. I did lots of other things that are too small to mention but here are the larger items. Here’s the cabin sole all laid out in the cockpit prior to the final installation. Yes, that’s 26 individual pieces. I used an interesting product called “Ultimate Sole” to finish it and it’s supposed to be non-skid even though it’s shiny. So far, so good. Hee is the finished sole in place! I like it. Here’s the new traveler. The old one came out to the side of the cabin and didn’t provide a good sheeting angle so the new one goes out an additional 16″ or so on each side. The better angle with the wider set makes for better performance. I had to get new brackets made to provide support for the extra overhang but they fit perfectly. 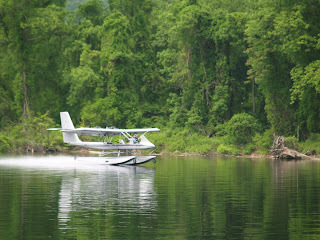 I got this idea from my friend Keith and confirmed it with the boat’s designer, Bob Perry. It does make a big difference. The boat’s faster and heels less. This is a closeup of the new brackets. Really nice work by Klako Marine in Canada. 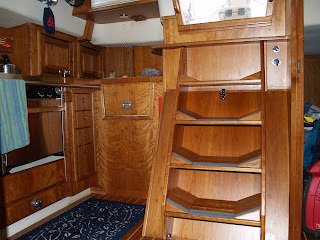 I also added wedges in the companionway steps so that it would be easier to enter the cabin when the boat is heeled. This gives us a “level” surface to stand on when the boat is on an angle. Very nice to have and gives much better footing.